The Alaska Airlines Visa Business Card currently has an Informr score of 7.4 out of 10. This score is based on our evaluation of 6 sources including reviews from users and the web's most trusted critics. Alaska Airlines Visa Business Card is typically available to those with excellent credit scores (650 or greater). The Alaska Airline Visa Business credit card offers many valuable incentives for business owners, including a buy one, get one for taxes and fees airline ticket and an annual companion fare. If your business flies frequently with Alaska Airlines or Virgin America, you can benefit from mile multiples on your spending and reduced companion fares. And the generous bonus miles you can earn at signup are easily attainable, making up for any annual fee. The Alaska Airlines Visa Business Card is a fantastic option for business owners who are frequent customers of Alaska Airlines or its travel partners. However, the miles earned with the Alaska Airlines Visa Business Card can only be used to book travel through the Alaska Airlines Mileage Plan. It offers a decent sign-up bonus after reaching a low minimum spending requirement and three miles per dollar spent with either Alaska Airlines or Virgin America, which is a high return on a co-branded airline card. The Alaska Visa Business Card isn’t one that I’d necessarily put all of my business spend on (unless you’re desperately in need of Alaska miles), though the card offers an excellent welcome bonus and is also worth holding onto long term. Long term I think the card is worth holding onto for the companion fare on your account anniversary every year, and also for the free checked bag on Alaska itineraries, if that’s something you’d get value out of. 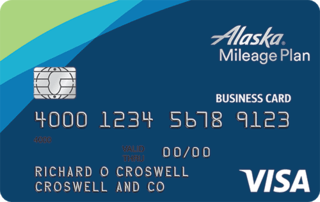 This card is recommended for those who travel to Alaska for business trips often or if your business prefers Alaska Airlines as your airline provider to get the most out of this card.